JEFFERSON CITY, Mo. – Missourians should be seeing more money in their pockets the coming years, a result of a bill signed into law by Gov. Mike Parson. Visiting Springfield on Thursday morning, Gov. 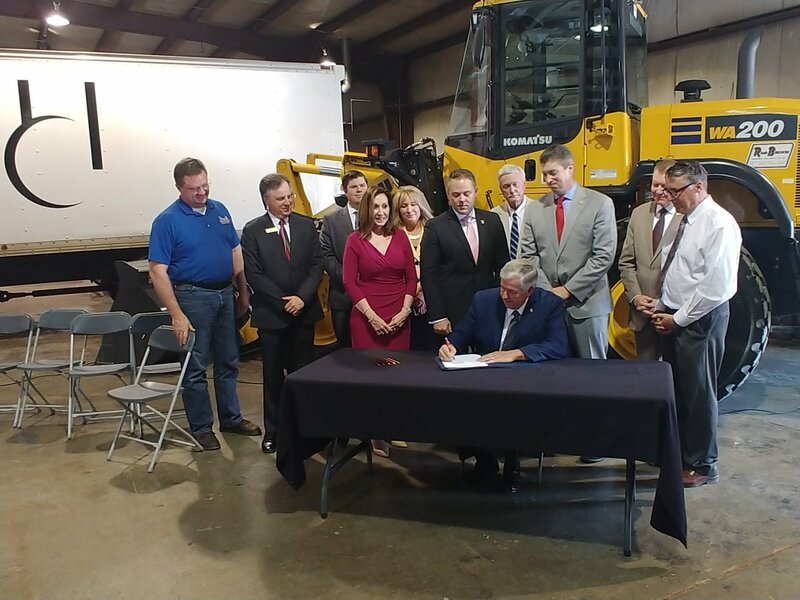 Parson signed legislation putting in place an income tax cut, the result of the push for tax reform led by House Speaker Pro Tem Elijah Haahr and Sen. Bill Eigel during the past legislative session. Both lawmakers were present for the signing of the bill, which took place at Hartman & Company’s shop location. HB 2540 will put into effect the largest single-year income tax cut in the state’s history, which proponents of the legislation say will allow Missouri families to keep more of their paychecks while also boosting Missouri’s economy with reforms to both the individual income tax and the state’s business tax. This news comes as Missouri State Treasurer Eric Schmitt confirmed on Wednesday that state revenue growth triggered an income tax cut from 5.9 percent to 5.8 percent, a result of SB 509, legislation he sponsored during his tenure in the state senate in 2014. His legislation marked the first individual income tax rate reduction in 100 years. Schmitt’s legislation required triggers to be met to put the reductions in place, with the first 0.1 percent reduction taking effect in 2018. Schmitt confirmed that the rate is set to fall another 0.1 percent in 2019, while also stating that Haahr’s HB 2540 would further reduce the rate to 5.4 percent, as well as eliminating the “obsolete top bracket” if signed into law. HB 2540 will further reduce the individual income tax rate by four-tenths of a percent from 5.8 percent to 5.4 percent starting in 2019. Additional triggers in the bill would lower the individual tax income rate to 5.1 percent, making Missouri the 14th lowest income tax state in the country. Schmitt also said that state revenue growth also means the amount of business income small business owners can deduct from their individual taxes will increase from 5 percent to 10 percent for their 2019 filings, a 5 percent increase over the previous year. And though the tax cuts mark a significant change for Missourians, officials do not intend to stop there. Parson says he sees this as the first step to long-term tax reform that will benefit Missouri citizens and businesses alike.